He just is. It’s like watching two different races. Cavendish sprints at one speed. Everyone else goes at another speed. You really have to see it to understand. Four stage wins so far this year. I really hope he makes it to Paris. At only 23, I think he’s got a lot of green jerseys in his future once his endurance starts to come around. Right now, he’s only got the legs for one sprint a day, so he can’t contest the intermediate sprints. And besides doing his serious talking with his legs, he manages to give some really nice interviews. He’s incredibly humble and gives so much credit to his team, who really has done a great job. 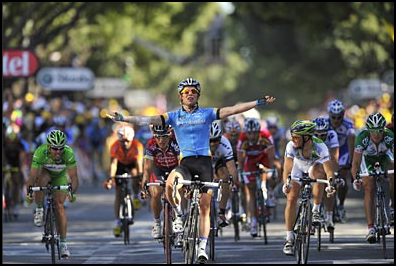 But it’s been (relatively) easy for them – just make sure Cavendish is somewhere near the front when the sprint starts. He can go so early and jump so hard, it doesn’t matter who is in front of him. He just needs a body in front of him until he wants to drop the hammer. Once he does, he can go around and no one goes with him. WOW. It’s just awesome. ← No Legs. Huge Heart. I hope he doesn’t turn out to be the latest “too-good-to-be-true” cylist at the Tour.It’s pretty sad that that is my first thought when I hear about a good cyclist. I feel the same way. But by all accounts, Bob Stapleton is as anti-doping as they come. Columbia/High-Road and Garmin-Chipotle/Slipstream really *seem* to be committed to keeping the sport clean. I think it does show that Cavendish is human in that he is not contesting the intermediate sprints as he doesn’t have the juice to go for it multiple times. That sort of “weakness” makes me believe in him. But really, I do believe in those two teams, as well as CSC and some others, about their desire to keep the sport clean. i was parousing your right column, BAMF Blogs…if i have that tattoed on my from a drunken something, do i get in there?